i really wish morningstar never discontinued their veggie pepperoni frozen pizza, now that was good eating. Tiny, mildly nasty, yes. 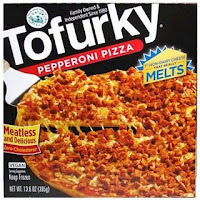 These match my experiences with the Tofurkey pizzas. I have had a good vegan pizza, but it was in a restaurant. ZPizza's Berkeley pizza with veggi burger crumbles is pretty good. Well that explains why these just sit in the freezer at the grocery and get all freezer burned.